Fossils are the remains of prehistoric animals and plants that have been transformed into stone. They are used by shamans throughout the world to amplify energy and can be placed on the altar to increase the power of any magical ritual. Fossils are frequently worn or carried to increase one's natural defences and to extend one's life expectancy. In general, fossils are used as protective amulets and can assist in past life recall. 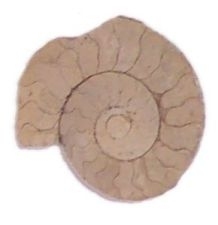 Ammonites (fossilised, spiral shaped sea animals) were once believed to be stones removed from a dragon's head! These 160 million year old ammonites from the Middle Jurassic period are also known as "snake stones". Ammonites help bring stability and structure to one's life and can help transform negativity into a smooth flowing energy. They assist relaxation and help ease depression associated with the birthing process.